Did you know that when you scuff your shoes and you don’t have time to go to the shoe repair to get them repainted, you can DIY?! One of my favorite tricks is to paint my shoes with a matching nail polish, or combination of nail polishes, to keep them going when I’m on the go. I have stopped into one of my favorite downtown DC salons, Celadon, many times when I have been in a bind and needed a nail polish fix. Celadon sells the Deoborah Lippman nail polish that I mixed to paint my metallic shoes. 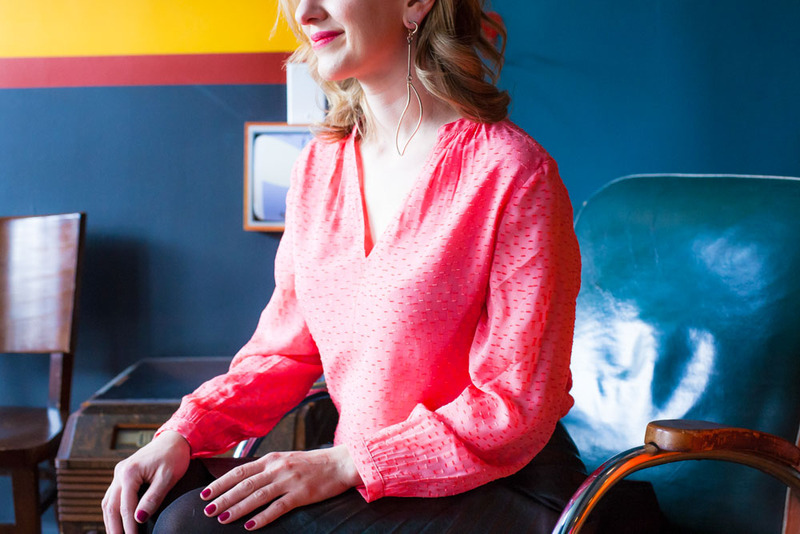 In these photos I was actually preparing my shoes for a Politiquette photo shoot. Any brand of nail polish will work and this is one of my favorite ways to solve a minor, but important, situation that working women face everyday. Photo Information: Photos taken by Anna Meyer at Celadon Spa. Hugo Boss is a German based company founded in 1923. Most people associate the name Hugo Boss with their dapper men’s suiting, but what they may not realize is that the brand designs beautiful clothing and suiting for women. In fact Hugo Boss appointed designer Jason Wu as their creative director of womenswear in 2013; Wu is known best for designing both of First Lady Michelle Obama’s Inauguration gowns and being one of her favorite designers of everyday fashion. There is a Hugo Boss store located downtown DC at City Center, conveniently located in the professional district, that carries the full Hugo Boss women’s collection. As of today, the current CEO of Hugo Boss announced that he is stepping down due to weak sales in both China and the US. Read more here. I am personally relieved that wearing suits is no longer an everyday standard required of women in professional settings. However, there are times when you need a really well made suit with a great cut. For years I tried many suit brands including Theory, J. Crew and even Ann Taylor. I couldn’t find a suit that was flattering to my womanly figure that was still reasonably priced. I finally dedicated a shopping trip to finding the best suit. I really didn’t want to have to pay an outrageous price and have to eat at Subway for the next month, but I was on a mission to find the perfect suit. I tried on many brands and finally the salesperson asked if I had ever tried Hugo Boss? I didn’t realize at that time that Hugo Boss made women’s clothing, but I knew their men’s suits were outstanding. She brought me the suit featured in my photos today and I have never looked back. This suit is the BEST suit I have ever owned. I eventually bought the navy version. After buying this suit I have run into many female professionals who own and love the same suit. What is interesting is that these women all have very different body types and their ages range from late twenties to late sixties. I mean, I’ve never heard of a clothing designer creating one item that can be appropriate for multiple age groups and body types. I’m sort of convinced Hugo Boss is the miracle worker of women’s suits. This suit is appropriate for business. There are suits for other occasions, but this is 100% workwear. I plan to periodically post different looks I wear with my Hugo Boss suit. I am always looking for inspiration when it comes to wearing suits. Photo Information: Photos taken by Anna Meyer at Celadon Spa. Please look for a special “Celadon” feature on Politiquette soon about why blow outs save you time and money. This leaf shaped earring is part of the “Dior Shades” line and was designed for the Dior 2016 Cruise Fashion show. Dior is known for influencing both the single earring look, as well as mismatching earrings. Under the leadership of former creative director, Raf Simons, the Dior accessories line the past few years has been very innovative and edgy. Dior Tribale earrings have especially gained attention and mainstream popularity. Better late to the party than not show up at all. For the past couple years designers have been featuring the single earring look on their runways; Celine, Louis Vuitton and of course Dior. I’ve been on the fence about trying this trend out until I saw the Dior earring I am featuring today at their CityCenterDC boutique. I would have walked right by it, but one of the sales associates was wearing it, looking fierce. I tried on the earring and the rest is history. Fortunately there are many great earrings to wear on their own without having to splurge at Dior. You should take a look in your jewelry box and see what oversized earrings you have that you could take from a pair. I have also seen some great options at Zara this season. If this look is worn right, meaning you own it, you can wear the single earring trend to work, formal events, and on your most casual days. Photos taken by Anna Meyer at Songbyrd. Makeup by Melissa at Celadon Spa. Songbyrd Music House & Record Cafe is DC’s home for music lovers. Nestled at the top of iconic Adams Morgan, Songbyrd offers an opportunity to explore music from national and local acts through our unique spaces, along with a meal and beverage. 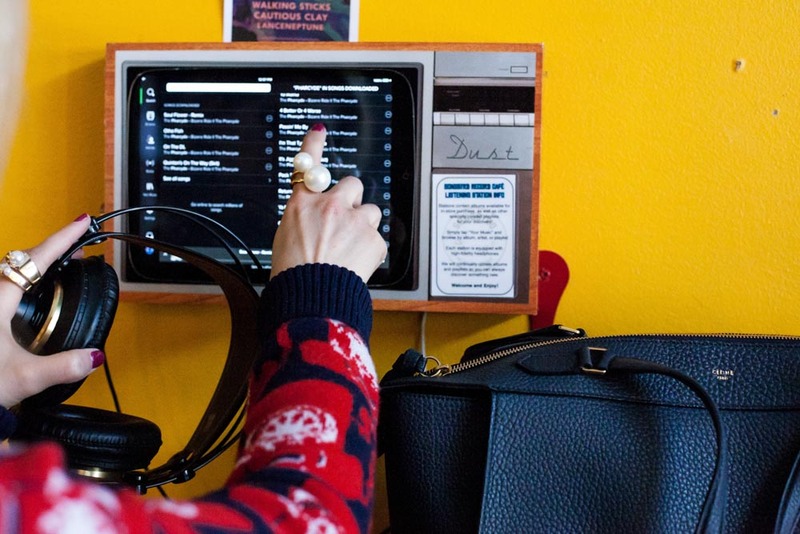 Enjoy their full espresso bar and casual eats while browsing latest vinyl releases and reissues in the Record Cafe. Or share a nighttime seasonal meal with a craft cocktail or beer, while getting down with the DC’s best DJs in the Music House. And open in October 2015 is their brand-new music venue, a space for regular shows for touring and local acts, as well as other music-related programming. This cardigan was purchased on The Real Real, one of my favorite consignment websites. You can find the sweater version at Neiman Marcus that is outrageously expensive. I was able to grab this cardigan, that is a current season item, at 80% off of the retail price by purchasing it on consignment. I am a big advocate of consignment purchases. TGIF! I always love Friday, especially because it’s a dress casual day for most Washingtonians. I am sure that this week Hill staff have observed casual Friday all week long with Congress in recess. I always find casual Friday to be my favorite day of the week because I can wear jeans, but challenging because there is a fine line between office appropriate and weekend wear. My main rule of thumb is to style jeans with tailored, classic pieces in order to achieve the perfect casual Friday look. Wear something structured on top. 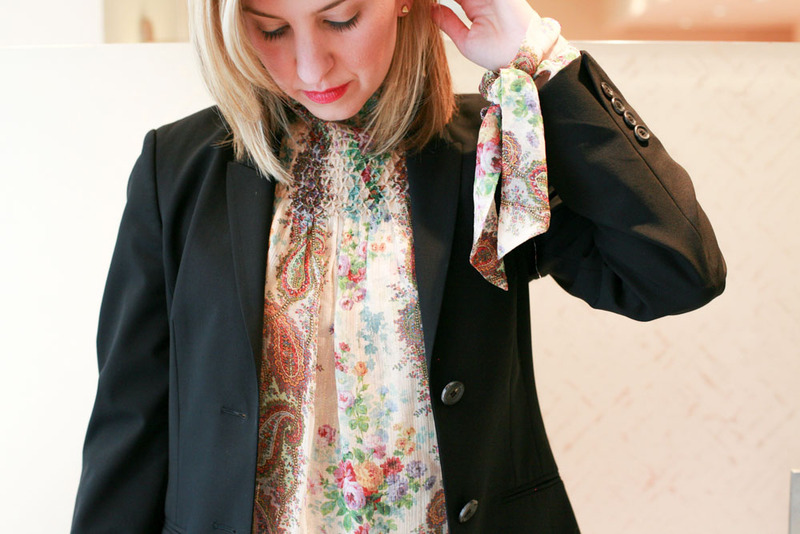 A blazer over a tee or top, a cardigan over a tee/top (and keep the cardigan on for meetings), a crisp button up, a conservative silk top. Jeans should not be too tight. No holes in jeans even though its very on trend. Jeans should be fresh and new. Opt for a mid-heel shoe (the new flat) or a bootie. Killer pumps are kind of trying to hard for the office. 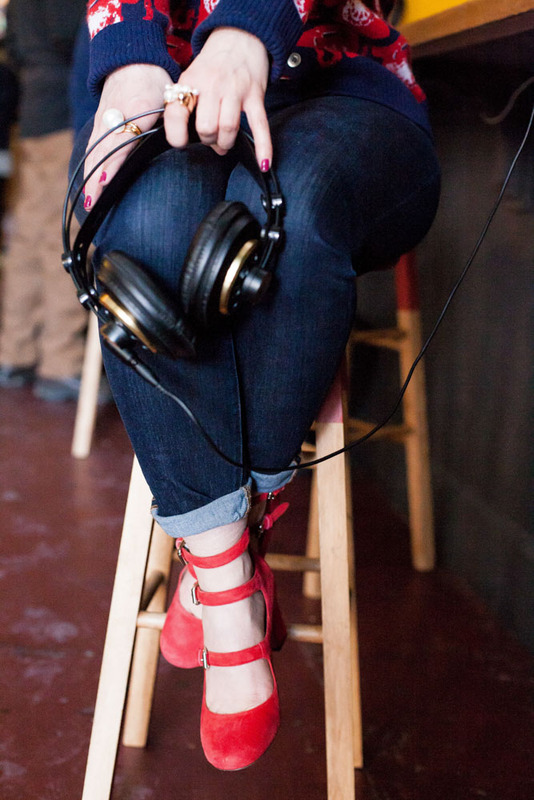 Bring them in your work bag for happy hour or your “right swipe” meetup for the night. Photos taken by Anna Meyer at Songbyrd in Adams Morgan. Makeup courtesy of Celadon. 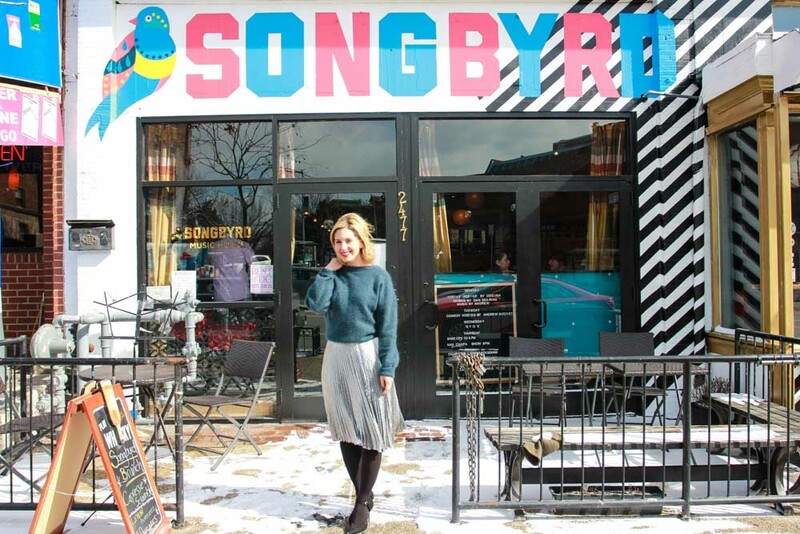 A great story on Songbyrd was published just last week in the dcist. I am a fan of mixing up the pieces in my wardrobe in new ways. It keeps things fresh and helps my pocketbook significantly. 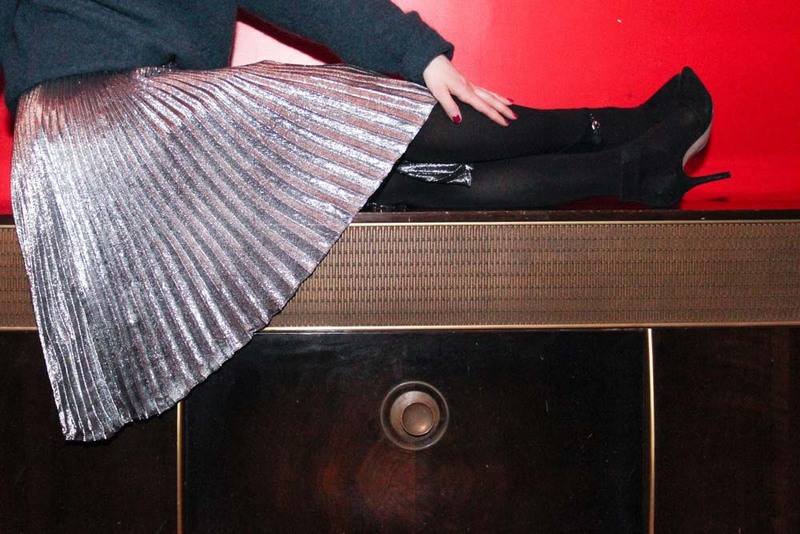 I love this metallic skirt and wore it many time during the holidays. Metallic skirts and lurex in general are still, and even more so now, very in fashion and I want to make sure I get as much mileage as I can from this piece. The last time I featured this skirt it was the holiday season. The way wearing sparkles worked a couple of months ago needs to be altered for the season. It’s the end of winter (hopefully) and about to be spring. With the snow, rain, sleet or whatever else is falling from the sky I want to be cozy, but still stylish. Wearing a casual oversized sweater with this fancy skirt is a great way to embrace the transition season, staying warm, and looking stylish. 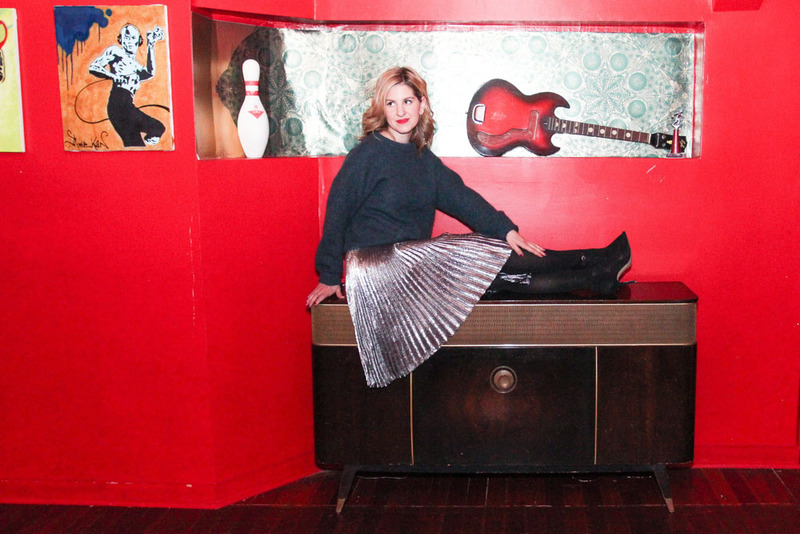 Casual sweaters and even sweatshirts are a great way to downplay a fancy skirt like the one I featured today. The look I am featuring is a look that can go from day to night. You can definitely wear this outfit to the office, but it’s also great for dinner or a reception at night. …Or when performing live on stage at Songbyrd in Adams Morgan! Photos taken by Anna Meyer at Songbyrd. Photos were taken in their new basement music venue. Makeup by Melissa at Celadon Spa (c/0). I discovered Songbyrd shortly after they opened their doors thanks to two of my dear friends, Lauren and DJKC. I have since attended a great party hosted by DJKC in the new basement music venue at Songbyrd. Definitely one of the more fun nights out I have had in DC due to the quality of music and atmosphere. When I showed up this past Saturday to shoot for Politiquette, I was blown away by the brunch session infused with legit soul recordings. Many of them DC originals. I learned that DC’s Kevin Coombe of DC Soul Recordings also spins regularly at this venue. If I wasn’t sold already, that sealed the deal. The people, food, beverages, decor and most importantly music are all exceptional at Songbyrd. If you haven’t checked out this venue, a visit should be at the top of your list. Lookout for two more posts this week that will feature the Songbyrd dining area and the listening cafe. Special thanks to Joe and Alisha for their hospitality!